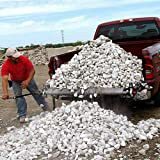 This cool new LoadHandler transforms a truck bed into a heavy duty conveyor belt to quickly unload up to 3000 pounds of rocks, soil, firewood, mulch, and more in only 30 seconds. 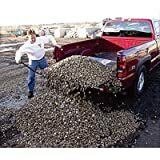 Forget renting a dump truck, just install this convenient hand-cranked drag sheet onto the tailgate of your mid-size or full-size truck bed (two sizes available and no drilling, welding, or cutting required), drop in a load, transport it to your destination, and then simply turn the crank to wind up the sheet to unload the contents in the bed off the back end. A great DIY solution to not only save your truck, your back, and your time, but also your wallet in saved dump truck rental fees. Check out this video to see it in action. Cool huh?